Photo courtesy of Busch Gardens Boise, a wolf pup originally found alone on Warm Springs Road north of Ketchum, enjoys his new digs at Busch Gardens in Williamsburg, Va., in August. But Boise wasn’t the only wolf this year to make the news; two breeding pairs were confirmed in Blaine County and local ranchers lost more than 40 sheep to wolves this summer, resulting in the deaths of two female wolves at the hands of Idaho Wildlife Services. Three wolf packs were confirmed living in the Wood River Valley this year, one of which may contain the remnants of the famed Phantom Hill wolf pack. Remote cameras set by field crew members of the Wood River Wolf Project captured images of three separate and well-established packs throughout the county. Project manager Suzanne Stone said in August that the remote cameras allowed the project to not only confirm that there were packs in the county, but that two of those packs were breeding. The first pack found was the Warm Springs Pack, confirmed in June when crews began hunting for a pack that lost a pup on Warm Springs Road northwest of Ketchum. Campers had picked up the pup on Memorial Day weekend, and crews began to hunt for the pup’s family. The pack has at least two adults and several pups. The second pack is the Little Wood Pack, which has been living in the southern Pioneer Mountains near Carey. Idaho Wildlife Services killed two members of the pack after recorded sheep depredations, but the pack still contained two to three adults in August. The third pack, known as the Pioneer Pack, was the last pack located. This pack encountered Gooding rancher John Faulkner’s sheep in the Lake Creek drainage north of Ketchum on July 3 and killed four sheep. The pack has at least two adults, to subadults and up to five pups—two of which were black, Stone said, raising the question of whether the pack might contain the remnants of the black-coated Phantom Hill Pack that dissipated from its territory north of Ketchum roughly two years ago. Stone said the pack might be more likely to have a connection with the now-defunct Hyndman Pack that dominated the area around Trail Creek in 2008. Though wolf advocates were excited to confirm the existence of three packs, two of which were breeding, ranchers were less than thrilled when those packs began killing their sheep. Faulkner lost four sheep to the Pioneer Pack in July, but no control order was issued. However, two wolves were killed in response when Carey rancher John Peavey lost 37 sheep to the Little Wood Pack in May and June, when ewes were lambing. That order was a controversial one, as wolf advocates said a conservation easement within Peavey’s ranch prevented lethal control of wolves on the entire property. The easement was of special concern because Blaine County had contributed more than $200,000 in matching funds toward the purchase of the easement in December 2011. The easement agreement contained a provision to prevent lethal control methods from occurring within the easement’s borders. However, officials said there was nothing preventing Idaho Wildlife Services from trapping and killing wolves outside of the easement’s boundaries or flying over the easement. Two female wolves were killed on the ranch following the depredations, one in May and one in July. Neither wolf was shot within the bounds of the conservation easement. One member of the Warm Springs wolf pack found a new home in a theme park in Virginia this year after out-of-town campers picked up what they thought was a domestic dog on Memorial Day weekend. The couple picked up the 5-week-old, 20-pound wolf pup on the afternoon of Friday, May 25, in the Sawtooth National Forest near Ketchum. Thinking it was a domestic puppy, the couple called the Ketchum Police Department and took the pup to a local vet’s office, where staff quickly realized the “lost puppy” was likely a wolf. 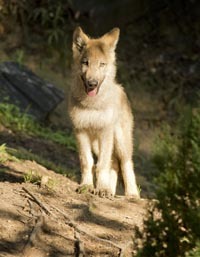 The pup, stressed and hungry, was moved to Zoo Boise and later to Busch Gardens in Williamsburg, Va. “Boise,” as the pup was christened, was introduced to his new pack in August. He joined two wolf pups from Montana named Beo and Kaya as well as a domestic dog named Mia who served as the pups’ surrogate mother. Boise and his pack-mates were introduced to the adult pack without incident this fall. Recently, a park animal trainer posted on the Busch Gardens Williamsburg blog about the puppies’ first Christmas. The blog post states that Boise enjoyed rolling in and playing tug with pine branches as part of the park’s Christmas Town attraction. A wolf was shot in the Deer Creek neighborhood north of Hailey in January 2012 after threatening a homeowner and his dog. Idaho Fish and Game Conservation Officer Lee Garwood said at the time that the young female wolf growled at the homeowner and the dog before laying down and going into what the man described as “convulsions.” It was suspected that the wolf was suffering from a disease called parvo. The wolf later dragged herself into the homeowner’s driveway, where the man shot it. “The homeowner didn’t want to see the thing suffer any further, so he euthanized it with a shot to the head,” Garwood said. It was not determined if the wolf was traveling alone or with a pack, but no packs have since been confirmed in the area.